For me this event usually marks the start of autumn, it is often the first time I notice a chill in the air. It was a much reduced number of teams this year. The club managed to get a men's team and a women's team, each of three runners. Selection for the team was difficult, heats were considered but in the end we took the six runners who had volunteered! It was a flat course, two laps with a total distance of 3K. I thought it would consist of the entire rugby fields (like the Parkrun, though this route was in the opposite direction), so it was a nice surprise that the course turned about half way down the furthest rugby field. I enjoyed it, it's good to do a bit of speedwork. I was well over a minute outside my best at this event, but I am not in any shape for these sort of events. Thanks to the club members who joined in and to Chris who supported us. 11.30pm 26th August. 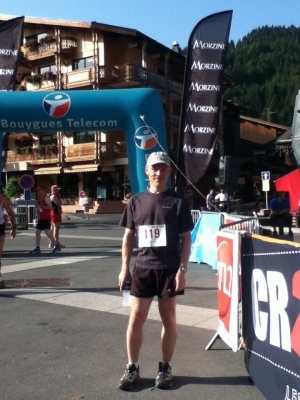 Here I was again at the start line in Chamonix this time with 2300 other runners and a very large crowd cheering and singing. It was raining but the general mood seemed to be good. I just wanted to get moving I'd been up since 7.30 am and an 11.30pm start to a race is something completely new for me. The first 8km to Les Houches is a nice warm up, very few bumps in the road but also very easy to go too fast as someone warned me at the beginning of the race. So I deliberately kept my pace down even when Joan my wife shouted at me to get moving as there were "thousands in front" of me :-) This is a long race and it doesn't start till you're 70k into it. The rain was pretty incessant throughout the first night, I bumped into Phil Owen and had a brief chat on the first big pull and also spoke to another chap called Nick who I knew from the UTLD. The first big descent into Les Contamines was fun with lots of mud and people slipping left right and centre. I'm not too bad running down hill so I picked up a couple of hundred places just plodding down through the muddy morass. The checkpoint at Les Contamines (31km) was my first real introduction to what the UTMB is all about. It was really lively, loads of people along the streets shouting encouragement and loads of food and drink. I realised all the spare food I was carrying was very likely to remain in my bag as I ran out of the checkpoint full of coffee, banana and noodle soup. Soon I was climbing again up to the Col de La Seigne (2515m) and heading into Italy. As I gained height it began to snow I'd had my hat, gloves and waterproofs on through out the night. As it was blooming cold I didn't want to stop to put over trousers on as I was worried about cooling down so I decided to get my head down and rely on the uphill plod to keep me warm. I reckon I got a few puzzled looks from my fellow runners who were all variously wrapped up in their winter garments and I had only my shorts on my bottom half. At the beginning of the descent down to lac Combal (64km) an English guy called Richard caught me up and we ran down together. I must say it was really good to have a chat. Even though it's a big event with a lot of runners it did feel pretty lonely during the night so I was really glad of the company. In the end I ran as far as La Fouly (109km) with him. The run down into Courmayer (77km) was hellish the sun had finally come out and it was hot, very steep and very dusty. My legs were well and truly battered and I finally realised I was in for one very long and tough run. We had drop bags at Courmayer so I was able to change my top and socks, again there was plenty of food and drink but I was starting to feel a bit queezy and didn't eat as much as I would have liked to. The views of the Brenva face of Mont Blanc running along the valley side along to Refuge Bertone (82km) and Refuge Bonatti (89km) at a more or less constant height of 2000m were awe inspiring the vertical rock and the pure white glaciers wow! Up and over the Grand Col Ferret (2537m) felt pretty good while I was climbing but coming down the other side I started to lose sight of Richard who was descending far better than I was. I waved him on and that was the last I saw of him. The run as far as La Fouly (109km) was slow and steady but I could feel my energy beginning to sap as well as my will power to continue running. This second night proved to be very tough from a mental point of view. It took me around 2hours to run 14 km between La Fouly and Champex Lac and I was so so miserable, it was dark and all I could do was look out for the next marker flag to follow. I ran along with a Chinese lad for a while but I think my foul language every time we hit another hill got too much for him :-) At Champex Lac (123km) I put on every item of clothing I had but still couldn't stop shivering I managed to vomit my coffee back up and texted Joan to say I was going to drop out. She texted me back (this was 1.30am by the way) saying I would be really peed off with myself if I dropped out at this stage so I had better give it some thought before jumping on a bus back to Chamonix. It was tough as I still had around 50km to run and a lot of climbing as well. I made really good progress up the climb and got my second or maybe third or fourth wind on the run down to Vallorcine. I felt I was going very slowly and when an official shouted Bravo to me I suggested I didn't deserve it as I was so slow. He responded by telling me I was in the top 400 in the race and going strong. I ain't doing it again mind you! Once is enough for me and my family. It was great fun and the drop from the plank seemed much higher that last year. I adopted the approach of not hesitating, get to the edge and go! Many congratulations to Will who was joint second. At three minutes to two I put down my unfinished cuppa, said seeyalater to Roberta and Hazel, and wandered outside the tea-tent to the start. I was still early. But it was for the best. I heard my name shouted and was delighted to see Angela and Sue (very unpurplery it has to be said) waiting on the Start Line. We'd all paid our two quid, and had our numbers allocated courtesy of the random race-number generator, so we stood in anticipation. Was the field comprised of 6? Or 2 thousand? Who could tell? 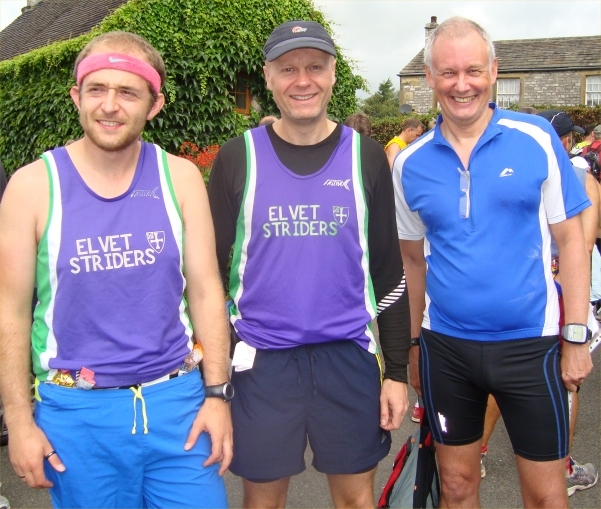 The Striders, all in purple, (did I mention, only one of us was running in the 'away' strip? ), gathered at the back of the field. I tried shoving Angela forwards to the Start Line, but she shoved me back, and so we club runners waited patiently at the back comfortable in the knowledge that it might be a short race but short is often a lot longer than you expect. I've raced Roseberry Topping (and so has Alister) and I know with certainty that a 2 mile fell race can seem a lot longer and harder than a marathon. I knew I'd be back inside 20 minutes. It'd just seem like 20 hours. Away we went and I ran with Angela and Sue to the first bridge and then we began to string out on the climb. I say climb; it seemed to be comprised entirely of steps, stiles, bridges, and cow pats. I settled down, concentrated, and got into a rhythm. I popped out through a gap in the wall into the lane and turned left ("it's all downhill now") and tried to stop wheezing. I was disappointed that the fast recovery descent didn't end up at the finish line, but instead we were diverted hard left through the fields and lots of gaps-in-walls, more fields, walls, stiles, gaps, cowpats, then, we must be near the finish now, surely? Nope. A long, endless, grinding climb up the lane by the showfield. Then a sharp-left into the show-ground and finally we're home. A glance at my watch showed that I'd been 'Out There' for less than 20 minutes. It felt like an eternity! The race winner had got back inside 15 minutes (a course record?) and was cheering everyone else in. Once everyone was home I wandered off with Angela, Stephanie, Sue, Andy and Angela and we soon found a spider or two that Sue ("I've always wanted to hold a Tarantula") could relax with. This is a fantastically well organised event. Medics and Marshalls must surely outnumber runners and were full of encouragement around the course. I wandered back to the tea-tent. Roberta was still there, in animated conversation with Hazel. Were they even aware I'd been away? I'd been and gone and had a massive adventure and they were still gassing! And my tea wasn't even cold yet. I love this race. Last year, I think I found it a bit tough, but very scenic. Moors, forests, woods, streams, views, it had it all. It started and finished in Robin Hood's Bay and there seemed to more runners this year. This year it seems to have been the wettest in living memory according to one marshall. It didn't rain much on the day, but on Friday it apparently threw it down and the course was very, very wet in places. We got our feet wet as soon as we got on the moors. There were puddles, and lots of mud of all sorts - dark, light, peaty. It made running difficult, but we weren't bothered, the aim was to get round and enjoy it. I managed to take a fall and got covered in mud. I was looking at my Garmin working out which way to go (I had downloaded the course) and suddenly this branch shot out of the undergrowth and caught my trailing leg. I grazed my knee, got covered in mud - hair, face everywhere. A shower in the next stream helped a lot. There were some really boggy bits. You would put your foot on some mud expecting to sink in a couple of inches and then before you knew it you you were up to your knees in the mud It was just great fun. We were doing fine, no problem in finishing, just trotting along when suddenly Christina went over on her ankle She felt quite dizzy and I think she went into shock. It was clear after a few minutes that she could not continue. So we phoned the organisers and she hobbled back to the nearest road and we were transported back to the finish and the two course meal that was waiting for us. We were impressed how many people stopped to offer help. The whole event was well organised, the marshalls in pirate outfits, friendly runners, great food at the checkpoints and at the end. We did about 17.5m and really enjoyed it Shame it had to end early, but there was no choice. Christina had her ankle checked out at hospital and it doesn't look broken, but it looks like she has strained ligaments, her ankle is now a deep purple! A classic agricultural show with sheep, horses, old tractors, strangely shaped vegetables, beer tent, and even the Titanic frozen in mid-plunge - what more could you want apart from a nice little fell race? Well, there was one of those too. For once, Morgan Donnelly didn't win it - because he was organising it - but we found out at the end that the relatively small field of 65 held some serious runners - Lizzie Adams, 1st lady today, who will be representing Great Britain in the World Mountain Running Championships in Albania next week led the field to the bottom of the hill, a Heaton Harrier led the way to the top of the hill and came 2nd overall and a couple of lads from Borrowdale were 1st and 5th. A quick dash across the show field led to a muddy drop-off to the streamside and a steady but runnable climb across a couple of fields and up over the western shoulder of the conical Dufton Pike. Down the other side and skirting the northern flank before turning right and climbing steeply up the eastern side to the summit. Good views of progress in the ploughing competition field way below could be had from up here, and then a lovely plunge down the grassy western ridgeline back to the shoulder and follow the outward route back to the showground where followed therapy in the form of a bacon butty and hot tea. This is race recommended for anyone new to fell racing, well marked course, nothing too difficult and no special equipment needed (apart from grippy shoes), with an entertaining show thrown in too. 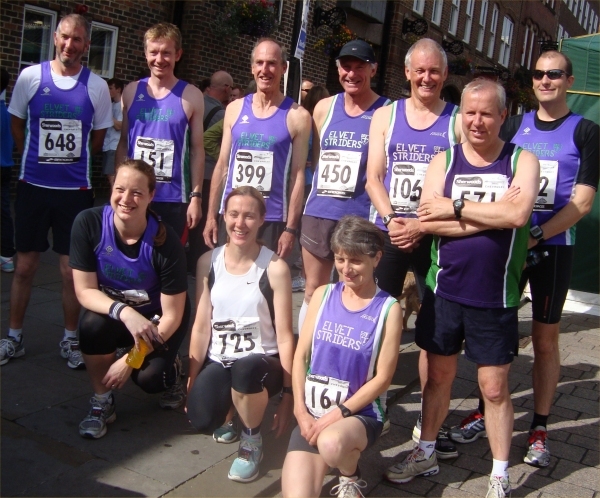 Geoff and Susan Davis were amongst a large group of NFRs, with Geoff winning the MV50 prize in 41.41. Honourable mention for Ralph Heppell who ran this race in 45.31 without any coersion from me, and altough I was a whisker ahead of Sue I was still beaten by the 1st MV60! Turns out I was the only Strider who made the trip to the lovely Watergate Countryside Park to do this two lap 5K. I was a little out of practise having not done a 5K since we started up Durham parkrun. This race although not flat, there's a sneaky little 'gotcha' hill towards the end of each lap, is still pretty fast and well organised. Parking was a little easier this year, (or maybe I was a little earlier in getting there) and registration at the Ravensdene Lodge Hotel was quick and efficient. Not bad value at £7 either if you had registered beforehand, although no T-shirt or prize. Although this is the North East vets 5K championship, unfortunately I don't think I qualify for that (until next year) At 6.40pm we watched the junior race, which I'm pretty sure was just one lap of the same course and that was well attended. The kids got medals. The main race started at 7pm and although a little bunched at the start soon spread out nicely. I tried to keep up with a few familiar faces at my familiar pace, but soon had to drop back. I made up for it a little by catching a few on the gentle hills - I guess that's the benefit of training in Durham, there's nowhere flat! This was my 50th 5K to match the 50th 10K I brought up at Darlington and I was pretty pleased to knock a couple of seconds off last years time. Five Striders ran this event (Will, John, Liz, me and Louise) and Jo was there supporting. The parking was at Hardwick Hall, but the race route was all to the east of the A177 so we walked to the start via the underpass which is used for the Sedgefield Serpentine race. It was a one lap course on grass - someone had been round with a mower and widened the narrow paths that were already there in certain parts of the course. It was very well marked and marshalled and good value for £4. It was a downhill start (and an uphill finish !) and there was a bit of undulation. I set off a bit fast and had to back off a little, but I was pleased to come in under 25 minutes. A lovely evening and I wish I had been able to do the other two races in the series. I hope the series will run again next year. I'd entered this race slightly on a whim, as you do when you're bored on the internet and looking for a new challenge. The word Peaks in the title attracted me and I hadn't done a 40 miler before so a guaranteed PB as a bonus. As the race drew closer I thought I'd better actually look at it in a bit more detail and discovered that a large proportion of it was along disused railway lines. Now railway lines aren't notoriously hilly so I lulled myself in the false sense of security that I was in for a fairly flat ride. It was the first time that the race had been held so no previous race reports to go by and although I'd been to the Peak District as a kid my memory of the area was rather patchy. Day dawned with patchy cloud. Forecast was for sun after weeks of rain, but the hope was it wouldn't get too hot. Registration at 7 and then we were bussed to the start at Cromford Meadows. The race briefing included a warning not to go too fast over the early sections due to the hills, ok so it isn't going to be as flat as I first thought it might be. First mile was along a canal then it was onto the steep climb of the High Peak trail. Even at just after 9 in the morning the sun was already beating down and temperature rapidly rising. After a mile of climbing it was onto more traditional railway track, very slight inclines and declines, punctuated with another couple of shorter but still fairly steep climbs up to checkpoint 1 at 10 miles. I'm no fan of railway tracks as I find them pretty monotonous but I have to admit that this one wasn't too bad as the surface was very smooth, nothing to trip over, so you could admire the views which were stunning. Unfortunately checkpoint 1 was wasp heaven so it was a quick in and out avoiding being stung. Shortly after the checkpoint we left the track and headed over fields to join the Tissington trail, another disused line. This one was a lot busier with cyclists so it was a matter of keeping your wits about you to avoid any accidents. There was very little shade and it seemed to be getting hotter by the second. Just as I was running out of water and the will to keep moving because of the heat checkpoint 2 came along with much needed water supplies and coke, ultra running nectar. The sugar in the coke soon kicked in and it was on towards Ashbourne (22 miles), the end of the Tissington trail and the end easy flatness of the railway lines. Ashbourne was buzzing with people, being a beautiful day in the summer holidays, but navigation was easy due the very clear markings both on the ground and every lampost. The climb out of Ashbourne seemed to go on for ever up lots of steps and at this point my head started to let me down. My legs felt fine but I was overheating badly, drinking loads but not able to face any food. Once the climb was over with the next section had some lovely running through the countryside, along paths and little country lanes and though a few villages with very tempting pubs. If it wasn't for the fact that I knew Phil O was manning the next checkpoint the temptation might have been too much and I might have stopped for a beer but I ploughed on and eventually got to checkpoint 3 (30ish miles). Onto the last section, the well named Long Lane. Yes it was long and yes it was fairly straight so you could see where you were going but it was unfortunately not flat. The combination of the heat, lack of food and now protesting legs made the 7 mile stretch feel like a marathon all on its own. Only positive that kept us going was the fact that we knew once it was done we really were onto the home straight with just 3 miles back into Derby. Other than a few stiles that the legs weren't keen on by this stage and some cows that decided to check whether we could still run as they shot towards us the last section was very pleasant and we were back into the city and the finish. The sense of achievement on finishing was great as it had been a tough day at the office. The race was fantastically organised, had a very laid back friendly atmosphere, with great marking of the course so there were no concerns of getting lost and ever cheerful marshalls at the checkpoints. On a cooler day it would have been perfect. Alister Robson and myself did the mini triathlon which as a first for both of us. The mini triathlon was one of three being held for the Stockton Tirathlon Festival - there was a sprint and standard distance later also being held which a few other triathlon club members were also doing, including Alister's wife Jaquie, and my hubby, Peter. The mini triathlon is particularly aimed at first timers but is open to anyone. I was quite looking forward to the triathlon - it was my first one and looking forward to the challenge. The mini triathlon consisted of a 260m pool swim, 13k bike followed by a 3k run [the bike and run were both on closed roads]. The swim consisted of just over 10 lengths. The swim is started at one end of the pool, and at the end of every second length you dip under the lane rope and start up the next lane. This is done for 10 lengths and at the end of the 10th length, dip under the lane rope again and swim to the exit half way up. I must admit, once I got to the side of the pool waiting to start, it hit me what I was about to do and if I would get to the end! I had to stop in the pool a couple of times just to get my breathing right - I'm unsure if this was nerves or what. Next was the bike, which for me was the my best part. The course was pretty much flat - the odd slight incline but nothing to shout home about; I don't like hills but I loved this route. The course is 3 laps of a 4.3k circuit. I was unsure how hard I could push myself with having the run afterwards but I thought do my best and worry about the run afterwards. Then it was the run; before the triathlon, I had been dreading getting off the bike to then do the run as I didn't know how I would feel. Sure enough my legs were just like jelly and could barely run at first. I had to walk some of the route but I did manage some running. I was pleased the run wasn't any longer as I felt at the time I couldn't have done it. The run was one lap of a 3k route which finishes on the riverside. I thought the overall organsiation was great, the marshalls friendly and encouraging along the way. I was a bit wary of entering any more triathlons before I did this one as I didn't know how I would enjoy them but I cannot wait for my next one. Steve the host at our chalet in Morzine pointed this race out the day before we were due to leave for Chamomix. It's an uphill race which is quite a common race in the mountains of Europe. The race is only 7km but climbs from the town square of Morzine at 990m to the summit of Pointe de Nyon at 2000m. A height gain of 1010m not sure what that is in old money but must be in the region of 3000feet. I enrolled for the race an hour or so before the start which required some sweet talking as they required my athletics number or a doctors certificate. I managed to convince the officials that I wouldn't collapse on route and duly received my souvenir cup and plastic beaker. The race started at 9.30 am and it was already In the low 20s and by the time I finished an hour and 13 minutes later it was blooming hot. The course itself wound its way up a mixture of woodland fire roads and narrow footpaths. I managed to run the first half up to the drinks station but after that the altitude and the heat began to take it's toll and I ran walked the rest of the route ( mainly walked). At the summit I was treated to various fruits, water, orange oh and wine! Just the ticket. Later I had a two course meal (included in the entry fee) and beer from the bar which had been set up on the mountain side. I'm not sure where I came in the race, but I wasn't last. Now for a slightly longer race! Preparation for this race was marred by the passing of my lucky marathon pink pants. They were the only item of anything that has been a constant in all 15 (ish) marathons I’ve run so far, and when I hopped happily into them on race morning my foot went through the last threads and that was that. Without them I felt naked in the dark. Turns out I was, so I turned the lights on, put some new lucky pants on and went to make my porridge. 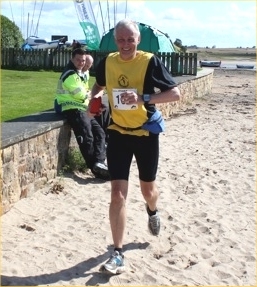 The race was really good, we started on the sand and pretty much hugged the coast line all the way round and back again, running on trails and bits on the sand. I’ve never done the Coastal Run, I had an entry three times but missed it each time as life always seems to get in the way. Now I can see why it is one of the most popular in the Striders Calendar. One to be enjoyed rather than raced though! It was quite a hardy field; Dave Robson, lots of 100 marathon club members and a bunch of North East Marathon Club members, a lot of faces I have noticed from other races. 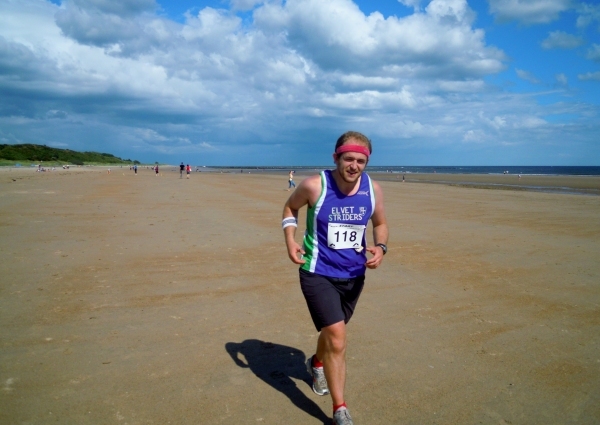 I’d recommend anyone interested to check out the NEMC who also organise the (entirely road free) Town Moor and the Druridge Bay Marathons. Organised by runners for runners in the North East I hope they do get a Durham Marathon going. I did learn one thing at this race; that I’m certainly not yet in the same league as most of this field, half of who I saw in Derbyshire two weeks ago, my legs began to really hurt and I felt really rough for most of the last 10 miles. Having said that my birthday Nikes have had a really hard life so far - Swaledale (not one of the 10 I know, but still a tough race), Coniston, Dovedale and now this - reckon there must have been 1400ft of climb over the first three of those races and this one was also a challenge but because of the terrain rather than the hills. Next up is Nottingham in 3 weeks - it will be nice to be amongst the crowds and glamour of a ‘Big Day Out’ Marathon, chance to take Mrs T for a weekend away as well! One other thing about the day, my friend Chris’s mum came with me and my mum to spectate this race, they popped up at 3 different points of the course and she was waiting for me at the finish line with a pint. She did, however make the oldest mistake in the non-runners book; never ever give someone a hug the second they cross the finish line - gross! I only realised this race was on two days ago, it is usually a week after the Darlington 10K rather than a day after. My legs were pretty tired today, so I knew it was going to be a bit tough. But I need to get used to running on tired legs so I dragged myself there. I have done this race a few times. They usually alter the course a bit each year and this year was no different. However, as usual my Garmin said it was slightly long. It was three laps, undulating slightly with most of it on park tarmac and the rest on grass. I was the only Strider running this year. My plan was just to run this as a training run for my first attempt at an olympic distance triathlon the next Sunday so my build up was probably not ideal - a 5k parkrun the day before, in fact, I wasn't planning on running at all but Lindsey managed to find me a number during the week preceding the race and as I would be in Darlington supporting her anyway I figured that I may as well run. We picked up Claire and John on the way down and got to Darlo early enough to grab a nice, relaxed coffee before the race. 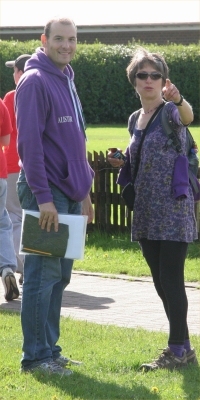 On the way to the start, we saw quite a few purple vests loitering on street corners - Greta, Mike, George, Jo to name but a few. As the race started, it began to rain, not really heavily but enough to make the roads a tad slippy in places for the first kilometre or so. My plan of taking it steady was working, I managed to catch up with Jan Young by the first water stop but didn't really lose her as I felt her presence when I was coming to the finish. [ Did you indeed! You really should have kept that quiet ... Ed. ] The rain didn't last long at all and it did get quite warm for the final 8km so the water stops were very welcome. As I approached the finish I heard Alister's dulcet tones cheering me on so I put a spurt on to the finish and then joined Alister to shout in the rest of the Striders. Lindsey had a good run and still looked as fresh as a daisy as she fought with Mike Elliott at the finish. I love this race, it's always very well organised and has great support from the local population and it is good that, as the building works in Darlington have finished, it seems to have settled down with a permanent course. 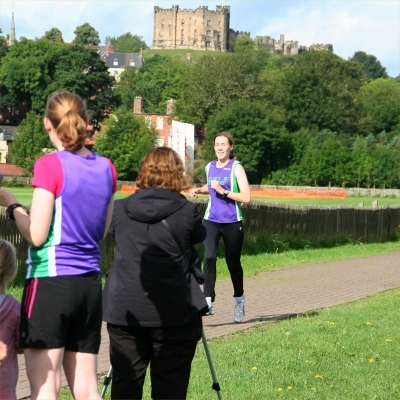 Congratulations to Alister and the team for getting Durham parkruns off to a great start! Over 150 runners turned up for the launch event on a bright sunny morning, and it all went off without a hitch. This event is going to be a great boost for running in Durham. Many thanks to all the volunteers and supporters. Results for the 26 Striders who took part are in the link, below, Dougie's taken some great photos, and George has created a great video ... well worth a look. Race number 6 took us to sunny Hartington, Peak District, for the Dovedale Dipper, it threatened 4000ft of climb over the 26.5 miles but, unafraid, Gibbo and myself set off bright and early (5.45am) on the 400 mile round trip. Dave R had taken a more sensible option of staying over nearby on the Saturday. Once again, in a random field in some far away place a group of Striders prepared to battle the best hills that mother nature (or the race organisers) could throw at us. The route set off and the first few miles were good running, gradual climbs with a couple of biggies in the middle taking us to the top of the valley. Halfway came and went and for the second race in a row I thought we must be lined up for an easier second half as we were running along the top of the hill looking back down into the valley where we had come from. Once more I was wrong, we turned a corner at about 15 miles and there she was right in front of us - the big one towering up into the clouds. The hill went on for days and I was sure Gibbo was going to blast off into the sunset at this point but he stayed with me - turns out there were two Strider charity runners out today! Running with someone who is much faster makes you run up hills normally you would walk, I plodded along and after a couple of miles we were rewarded with a great section of downhill, a mile or so of nice and gradual descent that helps recharge the batteries. There were a couple more hills but we managed them without much fuss and I thought we had broken the back of it. The last 6 miles are dead flat as the route traces the river back to the village but they were the hardest as the monotony of the track was getting a bit much. Again I felt bad as I was holding the fast man back in a big way but I just couldn't pick the pace up so we trundled along at 10 minute miles to the end. One more big hill at 24 and then straight back down it to the end at the village hall in just under 5 hours. Dave R finished about half an hour later looking fresh as a daisy, the man is a machine! Big well done and thanks to the Rotary LDWA group, this is the second run of the year I've done that they have organised and they have both been very well done and friendly events. Neither easy but both had free food, cake and an army of friendly volunteers, what more can you ask for! The drive home was a bit tougher than the way there but luckily I had my tape-book that I had hired from the Library. I gave Gibbo a 5 minute recap of the 7 hours that I had already listened to of the thrilling tale of the Zulu wars of the 1860's and then pressed play. Turns out we passed my mother who was driving back from York and she said when we zoomed past her Gibbo was waving his arms in the air and seemed to be yelling . She thought it was because of my driving, not this time. We had passed her at a very important part of the story as our heroes were destroying most of the Zulus single handed and it all got a bit much for him. I knew how he felt, I was struggling to keep it together too. Onwards from here to number 7, the Northumberland Coastal Marathon in a couple of weeks time and then it will be onto the final straight! This was my first ever international race and it would have been a travesty to turn the opportunity down. It was only 20 minutes from the in-laws house and was an evening kick off at 7pm. The training run up to this 12.6k course could not have been worse for me. With the many distractions of holiday preparation and a week in Paris I had only run 3 times in two weeks. Still,no excuses. At 5pm the weather resembled an Indian monsoon as it had done all day. By 5.30 we saw blue sky and this strange orange ball appeared in the sky. Fuelled by my banana, apple, fruit juice and coffee smoothie I set off to the start line at a small village in central Brittany called Callac. The race started on the bong of the church bell bang at 7pm and I began to realise I was surrounded by some seriously fit guys who represented a plethora of different running clubs from the region. The first part took us out of the village and straight onto a greasy grass hill before passing the local shrine of the Virgin Mary's grotto. I was certainly praying that I would get through the next bit as I was told that there would be a 2km climb after the start. Yes it was tough but not that tough. It was hard to get a pace as it was a few steep rises combined with some flatter bits. I decided then I was going to enjoy this one rather than my normal flat out antics driven by the speed read out on my Garmin. I had aimed to come in at about an hour and five minutes and was on track to do that when I reached St Aubain, just before half way. Coming out of the village I found myself in unfamiliar territory with muddy farm tracks and grassy woodland trails underfoot. This was pretty much the whole of the second part of the route with a few little hills chucked in for good measure. Still the sun had come out and I was steady away, actually passing some people. Every race I run has some bizarre moments and this one was turning a corner to find five guys dressed as bananas flaked out by the roadside. This was surpassed five minutes later by a bunch a people wearing multi-coloured wigs and waving pom-poms at everyone. In the distance I could see the final spire at Plumelec and thought it was still along way away. It was getting tougher and I was getting slower. Still the goal was in sight and about 1km outside of the final village I got a strong wiff of barbecue sausages. I had promised myself saucisse frittes at the club house when I finished and this spurred me on. Turning into the village I passed my wife who was sat happily outside the bar sipping her Perrier. With a few shouts of encouragement and the thought of chips at the end I decided to make a bit of a sprint for the finish, the last 500 meters approached. I passed the finish in 1 hour 7 minutes and went to get my goody bag. As we all know most British goody bags contain some powerade and a few muesli bars. Not the French. A bottle of cider and some pate. Vive La France! I went to get my chips! My fourth crack at this race now and yet another where I wasn't in shall we say 'peak' condition. This is almost always the first race back after our holidays, and although we haven't been away during July this year, an excellent wedding weekend was this year's excuse for me to dread the two laps and the long slow climb up the road. No other Striders (that I could see) were in the surprisingly large field; the race started late as there was a delay in registrations and collecting your prize (a mug) before the race. I've never understood why they (Morpeth Harriers) do that. You have to go back to your car to drop it off (a decent hike to the recommended parking at the Piramal factory and it's not exactly motivating knowing that you get that even if you drop out halfway through. Still, I guess that makes it unique. The race itself got off to a remarkably hot, muggy (22°C) and quiet start. I wasn't that far back from the front but I didn't hear it. Apparently they used a starting pistol in a previous year which spooked horses at the nearby farm and upset the farmer so I guess that explains it. I set off expecting the worst at a slowish pace but found myself comfortable at midway, in pace anyway. In terms of heat it was so bad that I had to drop off my sunglasses with a lady at the finish at the end of the first lap, my undershirt and vest were absolutely soaked and I was, for once, quite glad that I wasn't in my trademark hat and gloves. Everyone else seemed to struggle too and although the booze in my system (carbo loading?) and lack of miles in my legs conspired for a slower second lap, I found a bit of a spurt at the end, picked a few off and finished strongly in a decent if unspectacular time, a course best for me by a couple of minutes. A decent warm up for Darlo a week on Sunday.